A 25 years old youth was shot dead by a deputy manager of the State Bank of India, presently posted at Leimakhong Branch, over failure to provide space for take off of his vehicle. The incident happened at around 10 pm yesterday at Naoremthong under Lamphel Police Station. Report said that last evening, at around 10 pm, the deceased Prasanta along with his friends were on their way to witness a musical nite somewhere at Sekmai area until they reached near Salai Holding office and coincide with another I-20 vehicle. Prasanta , at the time was reportedly driving a Swift Car bearing registration number MN 06-LA 6624 with three of his friend, while another four of his friend were in another car (Cruze). A minor argument occurred with the person driving the I-20 car bearing registration No. MN-01 3G 6843 and the deceased Prasanta over failure to provide adequate space for take off near Salai Holding office at Tera. The driver of the I20 car, Chabungbam Budhachandra Singh 56yrs s/o Late Ch. Babudhon Singh of Sagolban Tera Loukrakpam Leikai who later turn out to be Deputy Manager SBI Branch Leimakhong, after taking off reportedly stopped his vehicle at Naoremthong (Bridge). Their he reportedly took out a pistol and stopped Prasanta. According to a friend of the deceased who happened to accompanied him yesterday, the Bank Manager along with one of his friend drives them out saying that they only need Prasanta. He was then pull inside the car and Budhachandra shot him dead inside the vehicle. The accused, Chabungbam Budhachandra Singh has been arrested by the Lamphel police and the pistol he used happens to be a license gun. Following the killing of the youth, large number of people of Changangei Ucheckon near airport blocked Tiddim road from around 8 am. A police team led by SP cools the anger saying that the accused has been arrested and that law will take its own course. Local MLA AK Mirabai also rushed the spot to take stock of the situation. The road blockade was later lifted at around 10 am after the SP Imphal West calm the anger of the local. Later, a meeting was held and a committee called Peoples’ Action Committee against the killing of Prasanta was formed. The PAC still do not claim the death body denouncing the killing. Colin Gonsalves, the Founder of Human Rights Law Network (HRLN) in an exclusive interview to Journalist Seram Rojesh at New Delhi, has extended his full support to the hue and cry of the right thinking people against the detention of Kishorechanda Wangkhem under National Security Act. “To say that Rani Jhansi has nothing to do with Manipur , whether right or wrong, is absolutely protected by Freedom of Expression. He may be right or he may be wrong, but there is nobody in the country who can prosecute a journalist or anybody for that matter on the basis of statement which is seemingly offence to some very conservative or right wing society; it is protected by freedom of expression”, Colin Gonsalves said. The founder of the HRNL further said that to use a “F” word or to use a swear word is a part of freedom of Expression. Giving observation to the statement which Kishorechandra Wangkhemcha has uploaded in Social media expressing his anger Colin Gonsalves said that the detent journalist has lawfully and justifiably use the swear word. “It is lawfully used , it is justifiably used and for the state to trial to such person is totally wrong”, the renowned activist said. He appealed the case of Kishorechandra be moved to the High Court immediately and gets bail in this matter. “Not only he should gets bail but this entire prosecution should be quashed”, Colin Gonsalves said and added that on the face of the FIR even if accepted the content be correct, to use a swear word is totally permissible under the constitution of India. It is part of Freedom of Expression and every Journalist , every Human Rights activist should stand up support Kishorechand in this tyrannical use of law against him, he added. Colin Gonsalves also stated that Human Rights Network Law Network stands fully with Kishorechandra Wangkhem and said that victory will be on the side of the journalist as what done is totally unconstitutional. During the the Annual General Body Meeting 2018(AGM 2018) of Human Rights Law Network (HRLN) held at Rajasthan from 19th December to 23rd December 2018 various issues of human rights violations in many parts of India including the arrest of a journalist in Manipur, Mr. Kishorechandra Wangkhemcha for using “F” word under NSA by the present government of Manipur was also discussed. Mr. Kishorchandra was arrested for his Facebook post criticizing the government of Manipur for organizing the birth anniversary of Rani Jhansi in Manipur. On this case of Kishorechandra, Mr Shreeji Vhavsar, senior advocate of the Supreme Court, associated with HRLN had gone to Imphal to meet Mrs. Ranjita Wankhemcha, the wife of Mr. Kishorechandra and went to Manipur Central Jail, Sajiwa to meet him on 20th December 2018. Even after 3 hours of waiting, the jail officials didn’t allow the advocate to meet his client. Staff reporter Heigrujam Sadananda of Poknapham daily and Reporter ST Lelen Vaiphei of Imphal Free Press have been jointly selected for The Khelen Thokchom Trust (KTT) Media Fellowship 2018-19 awards after their applications accompanied by the relevant documents were scrutinised by a two member expert committee of the KTT. Forty two year old Sadananda, a resident of Haobam Marak Ngangom Leikai,Imphal west district, has been working as a staff reporter(Sports) since Novemer 2006 till date while 26 years old ST Lelen Vaiphei, a resident of Bijang Aijalong Churachandpur district and presently staying in Lamphel CP quarter Type IV. On the other hand Lelen, a master degree in sociology holds diploma in Mass communication and Journalism and he is presently working as a reporter of Imphal Free Press. As announced earlier, the selected journalists will explore the potential and prospects of the game of cricket in Manipur thorough their research and documentation in the next three months. For which the KTT will provide a similar consolidated amount to both the fellows to support their research and travel etc. A special general body meeting of AMWJU convened yesterday in the wake of the series of criticism from sections of people to the seemingly silence of the journalists fraternity to the detention of Kishorechandra Wangkhemcha under NSA has clarified crystal clear that there is no difference of opinion with whoever concern with the detention as the All Manipur Working Journalists Union (AMWJU) regarding the slapping of National Security Act (NSA) to the journalist. “This meeting unanimously resolved to reiterate the resolutions adopted by the standing committee of the Union held on December 21, 2018 which condemned the detention of Kishorechandra under the National Security Act (NSA), by the state government”. The General body meeting however condemned the offensive words used by the journalist in his criticism of the state government and BJP leadership in a video posted in his facebook account. Regarding the letter wrote by the AMWJU President, Brozendro Ningomba to the Indian Journalists’ Union (IJU) in regard to the status of Kishorechandra and clarification on why the AMWJU, which fuel more criticism from more sections of people and students bodies, the special GB meeting also resolved to rectify the letter and sent another letter to the IJU, superseding the earlier letter by reiterating that the mother association shall not comment on any issue relating to an affiliated unit without first seeking its views. The Special GB meeting of the AMWJU also took serious note of criticism by some student bodies over Kishorechandra’s issue in the social media and resolved to appeal to those bodies to discuss any issue relating to AMWJU rather than commenting on social media to ensure that no misunderstanding occurs in future. 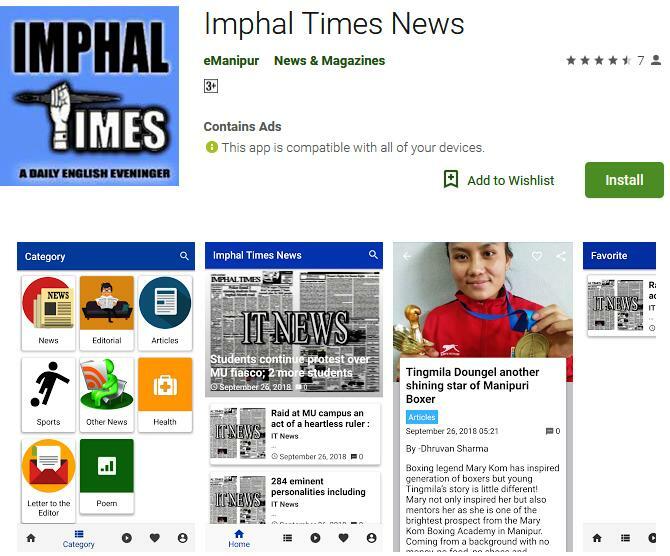 The meeting also condemns the boycotting of some daily newspaper except this newspaper (Imphal Times) and Imphal Free Press by Manipur University Students’ Union in MU Campus but resolved to invite the MUSU representatives for discussion to remove any misunderstanding. Manipuri artist Oinam Dilip was honored with the ART INC “Rising Star” award 2018, according to reports available here on Tuesday, the beautiful Christmas day. The award consists of a trophy, a certificate and cash award. The award was presented by Renu Rana of ART INC to honor masters and upcoming artists in the field of Painting, Sculptor and Photography in a gathering at India International Centre, New Delhi on December 24 Monday, the delayed report said. Eminent personalities of the art fraternity like Arpana Caur, Niren Sengupta, Hemant Khandelwal, and Biman Das comprise the panel of esteemed jury. The report added that Oinam Dilip is a freelance artist currently based in New Delhi with a degree from Delhi College of Art. His paintings have been collected in Korea, UK, US and Egypt. He is also currently working with Art Alive, one of India’s premium art Galleries in New Delhi. His first art exhibition which is an amalgamation of Dilip’s paintings, neo art installation by Kenny Ngairangbam and fashion-showcase by Sailex Ngairangbam, in Manipur titled ‘Art meets Fashion’ was held under the aegis of KAI from November 24 to December 4, 2019 at the building of Ningthibee collection, a popular handloom house in Imphal. It is said that Dilip’s paintings have been showcased along the paintings of some of India’s senior most artists in reputed art galleries of the country in Delhi, Mumbai, Kolkata and Bangalore and a few abroad and some of his paintings have been collected in Korea, UK, US, Egypt. Youth’s Forum for Protection of Human Rights (YFPHR) expressed regret terming the trend as shrinking space for the public to voice out the grievances against the Government in a so called largest democratic country in the world like India. A statement said that Kishorechandra’s detention by the state is a threat to the security of the civilians and for a nation at large for imposing a draconian act like NSA upon a lay man citizen. “ We understand the democracy as ”a nation running political ideology” is conceived to be the sounding voice and action of the people with the citizenry having a primary role to choose the competent candidature to represent the whole population of the nation with due sensitivity towards welfare of the public. “The hot boiling issue in vogue herein Manipur regarding the detention of Kishorechandra under the NSA (National Security Act) for his comment against the ruling Government should have been taken as a mere personal opinion exercised by a human and a citizen of the country and his expression should not be politicized to impose the law of NSA on his person and that the comment thrown by him may be of his personal reason. “The larger consideration of the ongoing feud and dilemma poses a question whether democratic ethos in India is sailing through with a healthy morale or not”, the statement said. The YPFHR demand the Government of Manipur to release Kishorechandra unconditionally before the youths of the state erupt to fight against the violations of ones right to freedom of speech and expression and against the suppression by the state for better future. Manipur Students’ Association, Delhi (MSAD), in association with Delhi Association of Manipur Muslim Students (DAMMS), is organising a candle light rally on 29th of this month (Saturday) at Delhi University, North Campus against the following against the arbitrary arrest of Wangkhemcha Wangthoi under NSA by the Manipur BJP government and the custodial killing of Abdul Gaffar of Lilong by the Indian military force (Assam Rifles) in Manipur. Why the uproar against Manipur media? Finally the wind seems to be settled. When it comes about the sanctity of journalism profession none get away, all comes together to protect it. Saying so it is better that we in the media community needs to dissects what went wrong, what prompted us to sit together to discuss issues which seems to malign our image. Well some of the recap with views from the ousiders. First, AMWJU in a statement released on the 3rd of December states “it doesn’t stand with any criminal-minded and mentally unsound person who acts and talks in the most uncivilised manner in an inebriated condition.” AMWJU has no authority to claim that a person is either criminal-minded or mentally unsound. These words prejudice Wangkhemcha in the public domain. Again, we must understand that being a criminal and being mentally unsound do not go hand in hand. Second, AMWJU’s president wrote a letter to Indian Journalist Union (IJU). It surfaced on the 21st of December in various media outlets. It writes that Wangkhemcha’s detention under NSA is a “non-issue.” It adds that “nobody wants to waste time talking about it, leave alone lifting a finger for him except a few people of his like…” Furthermore, it is only “one or two self-isolated [editors] from the mainstream” who are interested in creating a “media hype” in the matter. However, most of the mainstream media houses in Manipur are not in favour of “creating a media hype” and “the issues of NSA detention must be fought legally.” The letter accepts that there is a conscious toning down of the matter in Manipur’s mainstream media. His letter to IJU agrees with the general allegation circulating in the social media that nobody is talking about Wangkemcha’s NSA case. He exposes his politics when he overtly considers the use of draconian NSA a “non-issue,” especially when there is a general outcry against such draconian acts. Furthermore, in a press release on the 22nd of December, AMWJU’s standing committee declares that it collectively stands behind the content of his letter to IJU. Even if AMWJU’s leadership considers it a “non-issue,” Indian Journalist Union, Press Council of India and all rational souls must find it as a massive issue given the history of Wangkhemcha’s case and the seriousness of the charges, first sedition and now NSA. Third, AMWJU’s standing committee in the 22nd of December statement informed that it fully supports the content of its letter to IJU. So, AMWJU’s standing committee calls the matter a “non-issue.” However, it also condemns the preventive detention of Wangkhemcha under NSA in the same press release. For AMWJU’s standing committee, it seems the matter is both condemnable and at the same times a “non-issue.” The press release again states that individuals who are mocking AMWJU in social media platforms in Wangkhemcha’s matter should come to its office within three days. Otherwise, it will take legal action against those individuals. It is unheard that a body of journalists is calling people to its office for mocking it. Furthermore, what sort of legal action could be taken for mocking AMWJU, for calling it shameless, wasted or jockers? Is it going to be more draconian acts? Is it going to be defamation suits which people in power usually file against journalists in Manipur? It should be a matter of public debate. These are probably reasons behind the general uproar against the mainstream media. On the 25th of December, AMWJU held a special general body meeting to rectify its position on the arrest of Wangkhemcha and the content of the letter its president has sent to IJU. It has now vehemently condemned the detention of Wangkhemcha under NSA. One must appreciate this development in Wangkhemcha’s case. Better late than never. However, it must be remembered that things might have been different for Wangkhemcha if AMWJU had taken this stand immediately after that arrest of Wangkhemcha under sedition laws. It would have saved all of us a public heartache. Perhaps a headache to the Narendra Modi led NDA government, but for the opposition Congress it’s another hard tool to hit a slashing blow as a preparation for the upcoming 2019 Parliamentary election. Yes, it is the Rafale deal. In Manipur too leaders of Manipur Pradesh Congress Committee, led by CLP leader Okram Ibobi, CWC member Gaikhangam and MPCC president TN Haokip along with its squad took the street on Tuesday joining the mother party in denouncing the alleged misleading Supreme Court by the Modi led NDA government in the Rafale deal case. It is time that we understand what is all about Rafale deal? The story starts on August 28, 2017, when the then Defence Ministry accepted proposals for 126 MMRCA fighter Jets. MMRC means Medium Multi-Role Combat Aircraft Fighter jets. Various companies submitted their bids for buying the fighter jets. In May 2011, two aircraft were shortlisted - Euro Fighter and Rafale aircraft. Negotiation started in January 2012 , with Dassault Aviation for Rafale aircrafts. Negotiation started o January 2012, with Dassault Aviation for Rafale Aircrafts as their bid amount was very least. The deal was to purchase 126 fighter jets. Of which 18 fighter jets were supposed to be “Off the Shelf”. That is they were supposed to be manufactured in France. And they would have been ready to fly as soon as we got them. And the remaining 108 gighter jets were supposed to be manufactured in India by the Hundustan Aeronautics Limited (HAL). Dassault Aviation , The French company, was to transfer its technology to HAL. In which the company shares the information on how the fighter jets could be manufacture in India. Using this technology, HAL would have manufactured the remaining 108 jets. Transfer of Technology was an important aspect in the deal because, if in the future the relation between India and Franch take a bad turn or if Dassault Aviation could not manufacture aircraft, even then we could have made the aircraft ourselves in India, which would have been similar to the Rafale Aircraft. In March 2014, Dassault Aviation and HAL signed a “Work Share Agreement” which stated that 70% of the work to manufacture the 108 aircraft in India, was to be undertaken by HAL and the rest 30% by the Dassualt Aviation. The Negotiation took a long time as the two companies could not agree on several points. During this time our Government Changed and the negotiation were not finalized. Finally on March 25, Dassault’s CEO Eric Trappier said that the paper work was 95% completed. He said, “You can imagine my satisfaction to hear from the HAL Chairman that we are in agreement for the responsibility sharing …”. He said that the deal will be signed soon enough. On April 8, 2015, the Foreign Secretary of India said that negotiation among Indian Governemnt, HAL and Dassault’s are still not over. After 2 days Prime Minister Narendra Modi went to France and suddenly on April 10, 2015 a joint statement was issued by the Indian and French Governments that a new deal will be stuck. As per the new deal , 36 Rafale Aircraft were to be purchased by the Indian Government of which in Fly – Away off the Shelf condition. The opposition questioned this move as PM Modi finalized this deal without the approval of cabinet committee on Security. What happen to the old deal Which included 108 aircraft to be manufactured in India by HAL was what has been put up. After this , on 23rd September 2016, an Inter-Government agreement was finalized and signed. What’s interesting is that only a few a days before PM Modi’s France visit on 25th March and 28 March, 2015, 2 new companies were founded, - Reliance Defence Ltd. and Adani Defence Systems and Technologies Ltd.
It’s also interesting that under the new deal, India and France issued a joint statement on April 10, in which its was stated that ‘the aircraft and associated systems and weapons would be delivered under the same configurations as has been tested and approved by the Indian Air Force. That means the aircraft of the new deal were to be of the same configuration as under the previous deal. This is the logical interpretation of the joint statement. If someone agree to purchase a pen from for Rs. 100, then the pen will be given on the condition that Rs. 100 be paid back. But if an agreement is reached that of the Rs. 100, Rs. 50 will be invested in buyer company, that is an ‘Offset Clause’ in the contract. That means Offset Clause is a requirement under which the supplier is bound to spend part of the money in a specific place decided by the buyer and supplier. In the new Rafale deal there is an offset clause for 50% of the value. The deal is worth Rs. 60, 000 crores, which means India will buy fighter jets from Dassault for Rs. 60,000 crores. Out of it Dassault has to invest 50% of it , Rs. 30,000 crore , in India. Technically it should be up to decision in which Indian companies it wants to invest. On October 3, 2016, Anil Ambani’s Reliance group started a joint venture with Dassault Aviation. Dassualt reliance Aerospace ltd. On 21st June , a report in the Hindu Business Line stated that of the Rs. 30,000 crore offset money, Dassault is planning to invest rs. 21, 000 in the joint venture. This is the reason why the opposition, congress and Rahul Gandhi repeatedly question this deal and accuse the government of favoritism towards Anil Ambani’s Reliance Defence Ltd.
On September 21, 2018, the controversy blew up when the ex-Franch President Francis Hollande, who was the President from 2012 to 2017. He said that the Modi Government chose Anil Ambani as the Offset Partner and the Franch Government had no choice in it. Dassault responded to it, saying that it chose of its own accord. The present Franch government says that they have nothing to do with the deal as it was finalized by Dassault and reliance. On September 13 , 2018 , defence Minister Nirmala Sitharam said that the government had not given any suggestion to Dassualt and they chose Reliance on their own. October 21, 2019, Dassault’s CEO said that only 10% of the Offset obligations is supposed to go to reliance. The rest of the Offset money will be invested in more than 100 companies, This directly contradicts the report of the Hindu Business line and reports of other journalists who said that Rs. 21,000 crore is to be paid to reliance. The next controversy about the Rafale deal is about its cost. Congress spokesperson says that the cost of the old deal was Rs. 54,000 crore. The average cost of each plane was somewhere between Rs. 520-570 croe. Rahul Gandhi and Congress Spokesperson claim the cost was Rs. 526 crore per plane to be exact. On April 13, 2015, the then Defence Minister , Manohar Parrikar said that the cost of 126 Rafale aircraft would be Rs. 90,000 crores. It includes the cost of Technology Transfer, manufacturing infrastructure and even the cost of the additional parts that were to be including in the aircraft. This took up the average cost upto Rs. 714 crore per plane. Moving to the new deal. The cost for the new deal will be Rs. 59,000 crore for 36 jet fighters. That is Rs. 1638 crore per plane. This creats all the controversies. Congress asks how did the cost per plane jump up to Rs. 1638 crore from Rs. 526 crore ? Almost three times the original amount. Even if Manohar Parrikar’s calculation of the cost per plane is considered, Rs. 1638 crore is still a much larger price than Rs. 714 crore . what is the reason for it. On 18th Novemebr , 2018, the Junior Minister of Defenace said in the parliament, that as per the new Rafale deal the cost per plane is Rs. 670 crore, but it increase to Rs. 1638 crore because, they include the cost of other items such as weapons, maintenance and spare parts. Government of India tells that the total cost of the deal and the basic cost per plane. Other than these, the government does not disclose the details of specific expenditure on weapons, maintenance and spare parts. The Defence Minister and the Government cited national security as the reason for not revealing the details. An important thing that needs to be understood is, out of the 126 aircraft of the old deal, 108 were supposed to be manufactured in India, which could have brought down the cost of production. So we should actually compare the price of the ‘Off the Shelf’ planes – 18 from the old deal verses 36 from the new. That would be fair. But NDA government is not revealing the cost of the 18 planes even under the old deal. Comparing the cost with the Rafale deals of other countries, like Egypt and Qatar which also brought Rafale aircraft cannot be done accurately, as there is no specific details of the contracts made by those countries. On the other hand , France reveals the price of the rafale aircraft periodically. In 2013-14, France revealed the price of all the models. The price of the Rafale in that catalogue was between Rs. 500 – 600 crore per aircraft. If we compare with that, the price under the current deal is still way too much. Speculations and comparisons will continue till as there is no actual details of the cost. But will it be forever undisclosed due to national security? Four separate PILs were filed in the Supreme Court, demanding an investigation into the Rafale deal. On September 5, 2018, SC started hearing the hearing of the case. It asked thye Central Government to share, with the court, the details of the Rafale deal in a closed envelope. On 12 November , the central Government gave the details to the Supreme Court as directed. On December 14, SC gave its verdict. The 29 pages long judgment is available on the official website of the Supreme Court. In the judgement , the SC has stated that, it will not interfere in the case of Rafale deal as it is outside its jurisdiction. It is not the Supreme Court’s place to investigate sensitive defence deal or advice the government on it. “WE find no reason for any intervention by this court on this sensitive issue”. The case would have ended here, if there were not factual error in the SC judgement. But in reality, there were no such reports submitted to PAC. Neither is it available in the public domain nor has it been submitted in the parliament. And this is what Rahul Gandhi pointed it out in a press coference following the judgment. After Rahul Gandhi’s press conference, Modi government says that the sealed envelope given to the Supreme Court stating the details of the deal, was misinterpreted by the Supreme Court Judges. Which caused typing mistake in their report. They meant to say that the CAG report “ will be examined by the PAC”. But it was typred “has been examined by the PAC” in the report. The government has now put in a petition in the Supreme Cort to rectify the report. The leaders of opposition parties claim that the government is lying as three Supreme Court judges cannot all be grammatically wrong, resulting in the misinterpretation causing such a blunder. They also alleged that the sealed envelop given to the Supreme Court contain lies. Experts believe that the Supreme Court Jusgement may be declared null-and –void because the main point is factually incorrect. But the fact about - who is wrong and who is right will soon be coming up in the public domain after Supreme Court gives another verdict. Defending champions and the P.V. Sindhu-led Hyderabad Hunters could not have asked for a better opening to Season 4 in the Vodafone Premier League Badminton (PBL) than what they got against debutant Pune 7 Aces on Saturday night. But keeping the winning momentum is what would be weighing the minds of Hunters’ players, especially when they begin the home leg and play their first match against Chennai Smashers at home tomorrow. The confidence that Sindhu, who won the World Tour Finals, displayed the other night in Mumbai against reigning world champion Carolina Marin was something to marvel when the Indian beat her for the first time in the PBL. Having done that, she will be making all efforts along with her team members to maintain the winning momentum against the 2016 Champions, the Chennai Smashers. Sindhu before the start of the home leg did admit Mumbai was a dream start for the team but it would be important to concentrate on the job at hand. “Yes, it was a very good start and we managed to win our opening tie without dropping a single match. Now we are playing on home turf and I am really looking forward to keeping the winning momentum going,” she said. On the other hand, the Parupally Kashyap, who recently tied the knot to Saina Nehwal, has his task cut out as the Chennai Smashers would want to upset all calculations of the home team. For that to happen not only the reliable Kashyap has to lead from the front but also expect Sun Ji Hyun puts up a better showing against Sindhu. But the experienced Indian knows full well that the team has to jell well and fight with full force to dislodge a settled team like Hunters. “This is going to be the first match of this season for us and the team is really determined to give its best shot tomorrow. Hyderabad Hunters are one of the strongest teams this season and they have come here with a win already in their bag and would be very confident of repeating it. In the last few days, we have trained well and are looking forward to the opening night,” said Kashyap. Talking on his personal form, he said that the playing at the league was very important to him after having been plagued by injuries. “Personally, playing the PBL is very important to me. Most of this year has been a difficult one for me with all the injuries and staying away from the Court. Now that I have started playing and moving well, I am really looking forward to the matches,” added the Smasher winning team member from 2016. The Hyderabad leg of Season 4 will end on December 28 with the doubleheader being played on the last day. About Vodafone Premier Badminton League Season 4 The Vodafone Premier Badminton League Season 4, is the one of world’s richest prize money tournament offering a total prize of INR 6 Cr. The league is conducted by SportzLive, licensee partners of PBL and is organised under the aegis of Badminton Association of India (BAI), led by President Dr. Himanta Biswa Sarma. The league kick starts from December 22nd 2018-January 13th 2019 and will see 9 teams; Delhi Dashers, Mumbai Rockets, Hyderabad Hunters, Awadhe Warriors, Chennai Smashers, Bengaluru Raptors, Ahmedabad Smash Masters, North Eastern Warriors and Pune Seven Aces battle out in 5 different cities of India, including Mumbai, Pune, Hyderabad, Ahmedabad and Bengaluru. Matches will be telecast live on Star Sports and live streaming made available on Hotstar. The Badminton Association of India (BAI) is the Governing Body for Badminton in India recognized by Ministry of Sports, Govt. of India as National Sports Federation. BAI is registered under the Societies Act and recognised by Indian Olympic Association (IOA) and internationally affiliated to Badminton Asia Confederation (BAC) and Badminton World Federation (BWF). BAI was formed in 1934 and Badminton Associations of all States / UTs are its Member Associations. BAI organizes National Championships for all categories of Badminton players apart from Zonal, Inter State Championships and All India Ranking Tournaments in India. BAI also conducts various International Tournaments like the India Open World SuperSeries, Syed Modi India Grand Prix, India Junior International Championship along with the ambitious grassroot project, Shuttle Time which aims to reach 1.5 million school children in 21 States in 2018. BAI has also initiated the Coaching the Coaches programmes for creating a pool of Coaches to promote Badminton in India. About Sportz& Live Entertainment Pvt. Ltd. (Sportzlive) is a Gurgaon based sports management and marketing company set up by experienced industry veterans! It’s a venture capital funded company that acquires sports IPRs. It already has an impressive portfolio that includes the, Premier Badminton League, Indian Cue League (Snooker + Pool) and several other IPR properties. Sportzlive currently has about 90 days of Live action content as part of its overall vision for development of the sports ecosystem in the country. They have also set up North India’s largest Badminton Academy at Greater Noida in association with Pullela Gopichand.